CU CHI - What began as a routine hunter-killer mission for five men from Delta Troop, 3d Squadron, 4th Cavalry wound up as a daring and heroic rescue and recovery of a downed chopper near the Cambodian border. Flying at treetop level, the Cayuse observation helicopter started receiving fire from several enemy .51 caliber machinegun positions near Cu Chi. The Cayuse burst into flames as several enemy bullets struck it. The pilot, First Lieutenant Jerry Odum, skillfully regained control of the stricken chopper and headed for a clearing out of range of the enemy guns. ODUM MANEUVERED the LOH to a safe landing as he and his crew immediately evacuated the flaming cockpit. After the Cayuse came under the first volley of enemy fire, Captain George Joest and First Lieutenant Al Ward kept a watchful eye on the small helicopter from their Cobra gunship flying overhead. The moment the Cayuse touched the ground, the Cobra landed beside it. Nothing remained of the Cayuse except a huge ball of flame as the five airmen looked at each other, wondering how they would all fly out in a chopper built for two. Matters changed as the enemy zeroed in on them with small arms fire from a nearby woodline. JOEST DECIDED the Cobra needed some immediate interior decorating as the enemy bullets whizzed by their heads. He threw open the doors to the ammunition bay in the nose of the gunship and lifted out the massive 600-pound ammo casing. Once the casing was removed, two of the pilots jumped into the gunship as the other three men straddled the landing skids with half of their bodies inside of the ammo bay. 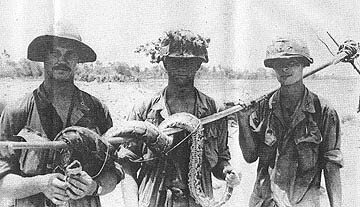 The Cobra had no trouble lifting off the ground and headed back to Cu Chi with the three airmen huddled around its nose. It made it to the base camp airstrip with all five men aboard without incident. Some may question the ability of Joest to lift a huge 600-pound ammo case without help. Joest returned to the scene of the daring rescue to retrieve the case the following day, and sure enough, he found it exactly where he had left it. But this time as he tried to lift it, he found that he wasn't quite the superman he had been the day before. He huffed and he puffed, but couldn't budge the case an inch. 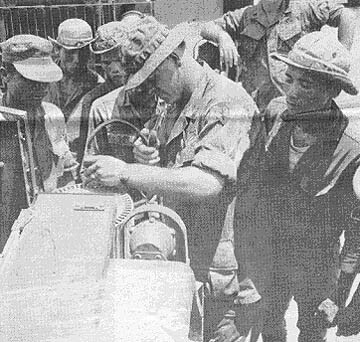 CU CHI - A simple orientation run turned into a tension-filled episode for Tropic Lightning air liaison officer Lieutenant Colonel Robert Straughan as he was briefing First Lieutenant Brooke Barnes. As the duo maneuvered in Straughan's OV-10 Bronco spotter plane, they unsuspectingly drew fire from four enemy .51 caliber machinegun positions. Straughan immediately radioed Bien Hoa Air Base asking for air strikes. IT WASN'T LONG before the F-100 Supersabres were on their way. Straughan had already planned the strategy in which he would mark the four positions for the jet fighter-bombers. He dived down to release the first white phosphorous rockets and found his aircraft literally ringed with red tracers as the enemy opened up with a total of nine .51 caliber machineguns. "That definitely changed my plan of action," said Straughan. He and Barnes weaved in and out as they dived to mark the targets. Following right on their tail were the jets carrying a payload of destructive ordnance. One by one the positions were eliminated. AS ONE OF the F-100s swept down on one position, the enemy gun crew raced out of the emplacement. The Supersabre zeroed in and dropped a bomb directly into the enemy position, destroying the machinegun and killing the crew. One .51 caliber position remained unsilenced as Straughan realized he had no more marking rounds. He headed the Bronco at the enemy emplacement and opened up with his organic machineguns and high explosive rockets as the enemy gunners frantically tried to zero in on the aircraft. Several of the rockets slammed into the emplacement, silencing the gun. The Air Force Supersabres dipped their wings goodbye as they headed for home. All nine .51 caliber machineguns were destroyed and 17 enemy soldiers died during the action. A mark of a professional soldier is that he uses all of the equipment available to him. Not making use of flak jackets and helmets when in suspected enemy areas is a foolish mistake. DEROS. Do it the safe way. Do you know what Uncle has in mind for you after you ETS? A frequently asked question by many short-timers is, "What is my military obligation after I get out." The answer is fairly simple, and it all depends on how much active duty time you've put in. If you entered the Army before you turned 26, you have a six-year military obligation unless you are discharged for some reason before the six years are up. Therefore, unless they have served six years of active duty, most soldiers still have some period of that military obligation remaining after they are released from active-duty status. The remaining time is spent in the Army Reserve. It is simple mathematics to subtract the amount of time you spent on active duty from the six-year total and come out with the time you will have to spend in a reserve status. What will your reserve status be? Many people want to know what their chances are of being called up to active duty. And they want to know whether it is likely they will return to Vietnam for another tour. There are two types of reserve units: Ready Reserve and Standby Reserve. In most cases you will be required to spend some time in each before your six-year obligation is fulfilled. Ready Reserves are subject to active duty call-up in any emergency declared by the President or by Congress. Ready Reserve units hold regular weekly meetings and spend two weeks each summer on active duty for training. Ready Reservists are assigned to units through which they can take part in career development programs, and they receive pay for the period they spend on active duty for training. All members of the National Guard are in units of the Ready Reserve. Standby Reservists are subject to be called for active duty only in the event of war or national emergency declared by Congress. Except for this availability, they serve no further active duty. Standby reserve units do not hold regular meetings, nor do they attend summer training camps. Under normal conditions soldiers who serve two years active duty will serve two years in the Ready and two in Standby Reserves. If you have been on active duty for three years, your Ready Reserve commitment is usually one year and your Standby, two. As a vet of the Nam, however, you receive special consideration. You will not be involuntarily assigned to a Ready Reserve unit for drill purposes (a bennie); that is, no weekly or monthly meetings. You may be expected to attend summer camp for active-duty training. How do Early Outs figure in? As far as determining the length of your Reserve commitment, early outs are not considered. So if you serve 29 months active duty, your reserve commitment is just four years (another bennie). Uncle will assign you to a reserve unit 90 days after your separation from the Army. You should probably stand warned too that when you are scheduled to report for summer training it is a good idea to comply - unless you want to permanently break out your wardrobe of that lovely shade of green. Here are a couple of good ways to save your money during your tour. The Uniformed Services Savings Deposit Program is perhaps the best savings plan in the world, but it is available only to U.S. servicemen overseas. A class S allotment or a cash deposit at your finance office gets the ball rolling - all the way to 10 per cent interest. This program pays 10 per cent compounded quarterly on your deposits. Money cannot be withdrawn until your return from overseas, except in cases of emergency or special leave. And you can keep your money in up to 90 days after return from overseas in order to take advantage of an extra dividend period. Savings Bonds, now more than ever, are a good investment. The interest rate has recently been raised to 4.25 per cent for long-term investment. You can invest in your country's future as well as your own. As an added bond-buying incentive, Uncle Sam offers bond purchasers Freedom Shares. These treasury notes pay a higher 5 per cent interest, and maturity is only four years from the date of purchase. 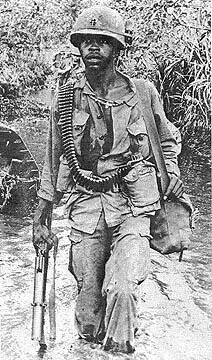 TWO PLATOONS FROM THE 2d Battalion, 12th Infantry, had cut short a Viet Cong training program when they eliminated a VC carrying documents identifying him as a training officer. Tropic Lightning Soldier of the Week, Sergeant First Class Donald Neal, was awarded the Silver Star for heroic actions on June 6, 1969. While serving as a platoon sergeant with Company B, 3d Battalion, 22d Infantry, at Fire Support Base Crook, SFC Neal distinguished himself as a courageous leader. When Crook was under heavy attack, Neal deployed his men into strategic fighting positions. He then moved through the hostile fire to a bunker that had sustained an RPG hit. While attending to the wounded, Sergeant Neal noticed movement in the nearest wire. He immediately jumped to the top of the bunker, firing his M-79 grenade launcher. An explosion in the wire knocked Neal to the ground, but he returned to the bunker and detonated the claymore mines as the enemy advanced. Sergeant Neal then continued to fire canister rounds at the enemy until the attack was repelled. The next morning revealed 23 of the aggressors killed in front of the bunker which Sergeant Neal single-handedly defended. Major General Ellis W. Williamson was with the B Company Regulars at Patrol Base Hansard II to present SFC Neal his award. General Williamson spoke with the troops and told them all of the important role they were playing in the overall picture. A change in Army regulations cuts in half the time enlisted personnel must wait before requesting re-evaluation if they are on a promotion list but have not been promoted. A change in paragraph 7-38e of AR 600-200 slices the required waiting period from one year to six months. The Army advises anyone wishing a re-evaluation that he subjects himself to the total promotion processing procedure in requesting the re-evaluation. Ah Sweet Slumber . . .
CU CHI - Chasing down the enemy during the hours of darkness was successful for one patrol of the 2d Battalion, 34th Armor and local Vietnamese soldiers that happened on a squad with a snoozing sentry. The patrol accounted for two Viet Cong killed and one detainee. Several small arms weapons were captured as well as one RPG launcher and several documents. Elements involved in the combined operation were soldiers from the 5th ARVN Division, the Reconnaissance Patrol from the 2d Battalion, 34th Armor and a Reconnaissance Patrol from the Regional Forces unit in Hau Nghia Province. THE MULTIPLE FORCE met and grouped at Fire Support Base Emory early in the evening. Once organized, the group waited until the early hours of morning to head out on their mission. As they moved out of the base they headed in the direction of Cu Chi Village, moving parallel to Highway 8A. In perfect silence they swept the land on line. The sweep team spotted one Viet Cong who was sacked out on guard. His presence didn't help his other sleeping comrades. The slumbering guard was silently detained for questioning and his grenade launcher was confiscated. The whispered interrogation brought out where the other members of the squad were sleeping. The allied forces split into two parties and moved into the broken terrain near a laterite pit. 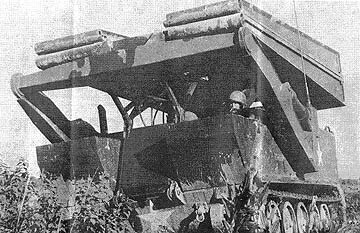 WHILE THE ALLIES poured small arms' fire into the Viet Cong positions, tracks and tanks from Headquarters Company, 2d Battalion, 34th Armor roared out of Fire Support Base Emory up Highway 8A and halted in a blocking position parallel to the conflict. Small arms fire was returned as the Viet Cong tried to flee. A sweep of the area began. Amid NVA poncho liners and web gear two enemy bodies were uncovered. Documents identified one of the dead as assistant platoon leader. DAU TIENG - A company commander's quarters suddenly became a little cramped recently when he had to share his room with an exploding enemy 107mm rocket. Captain Richard Sonstelie, commander of Delta Company, 65th Engineer Battalion, woke up at 4 a.m. as the deadly shell ripped through his roof and burst with a terrible blast into the floor. Miraculously unscratched by the blast that knocked out two walls and several rows of sandbags, the captain rolled out of bed and put on his boots. "I knew the rocket hadn't hit far away, but it wasn't until I got up and took a couple of steps that I discovered I no longer had a floor. It had made a direct hit in the middle of my room," recalled Sonstelie. The explosion caused a large fluorescent light to topple from the ceiling and hit the Alexandria, Va., officer, but his luck was still holding out as the bulb didn't break. All the amateur photographers in the company had a field day the following morning, taking pictures of the rubble that had been Sonstelie's hooch. "Everyone would kiddingly touch me for luck," Sonstelie said. Some told Sonstelie he must be the luckiest man alive. Has the incident affected the commander's sleeping habits? "Not at all," he replied. "No one in the company has moved underground, either." Congressman James C. Clevelend, Republican member of the U.S. House of Representatives from New Hampshire, toured the 25th Infantry Division's area of operations recently as part of a countrywide fact-finding mission. Cleveland visited three Tropic Lightning forward positions for briefings, demonstrations and meetings with soldiers from New Hampshire. The Congressman was escorted by Tropic Lightning CG Major General Ellis W. Williamson. CLEVELAND FLEW over much of the division's area of operations, including around Nui Ba Den, the 3,200 foot mountain-landmark near 1st Brigade headquarters at Tay Ninh. 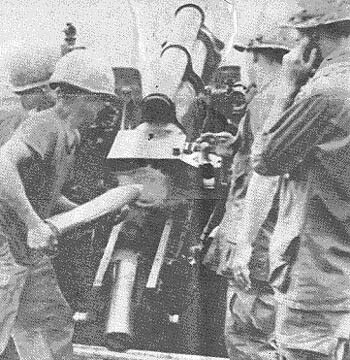 At Fire Support Base Pershing, eight miles northwest of Cu Chi, the Congressman witnessed a demonstration of "killer junior," a 105mm artillery weapon used primarily for perimeter defense because of its short range and deadly accuracy. Later in the morning, Cleveland traveled to Fire Support Base Jackson, seven miles south of Go Dau Ha, for a briefing concerning combined operations conducted by men of the 2d Battalion, 27th Infantry and local Vietnamese Regional Forces in the area southwest of Cu Chi. THE BRIEFING was given by General Williamson, Colonel William Maddox, commanding officer of Tropic Lightning's 3d Brigade, and Lieutenant Colonel Forest Rittgers, commanding officer of the 2d Battalion, 27th Infantry. Shortly after noon, Congressman Cleveland returned to Cu Chi base camp, from where he traveled to the 1st Air Cavalry Division area of operations later in the day. CU CHI - Would you believe building a complete patrol base in less than 12 hours right in the heart of "Charlie Country"? That's what Warriors from the 2d Battalion, 12th Infantry did recently, when they established Patrol Base "Little Pershing" just south of the Boi Loi Woods, five miles north of Trang Bang. The hard spot was named for the Warriors' main support base, Fire Support Base Pershing. The Boi Loi-Trang Bang area is notorious for its hiding spots in which enemy soldiers can rest undetected for a short period of time. The Warriors moved in early one morning and established their new base by nightfall. A SUITABLE SITE for the base was found through air reconnaissance. After selecting the location, Warrior Commander Lieutenant Colonel John E. Mann coordinated the materials and equipment necessary to set the construction plans into action. The night before building began, an ambush patrol dropped into the area to secure the site. At dawn, the same patrol began to construct the post by laying out the perimeter and bunker positions. A short time later, the rest of the defending company moved in with a bulldozer. Chinooks began hauling materials, and the real work began. CAPTAIN JOHN K. Taft of Youngstown, Ohio, coordinated construction. One platoon put out the concertina wire and claymore mines while the others built bunkers. While Delta Company worked, a platoon from Bravo Company maintained security for them. Meanwhile, the dozer was pushing up a protection berm and leveling obstructions in the fields of fire. Excellent ground and air coordination enabled quick and efficient transportation of materials and ammunition. By noon, all equipment had been inserted. This was a key to the base's rapid construction. BY NIGHTFALL, the hardworking Warriors had turned an open rice paddy into an impregnable patrol base. Every bunker was completed, the rocket-propelled grenade screen was completed, concertina wire was out, claymores were up, and heavy weapons were in place. In addition, mortar and artillery support were plotted and ready. Taft praised his men for their long, hard, and hot work as he said, "Now we are ready for Charlie." CU CHI - Confucius may not have said it, but Specialist 4 Carl Detrick learned the lesson: Man who chase Viet Cong across rice paddy should beware of what lurks beyond the next paddy dike. Or more simply, look before you leap. Detrick, from Lima, Ohio, was on a patrol with the reconnaissance unit of the 2d Battalion, 34th Armor, near Fire Support Base Emory. ARVN soldiers working with the platoon spotted a Viet Cong running across a field of rice paddies, but he was out of range of their rifles. Detrick, reacting quickly, ran pell-mell across the field in an attempt to cut the enemy soldier off. He had been a track runner in school. His legs churned and his M-16 pumped back and forth in his hands as he hurdled two rice paddy dikes. Then came the third. With excellent form, Detrick jumped the wall. Splash! He landed in a well completely filled with rain water. "I never did hit the bottom," he said. "I don't even know how far down the well went. But I did get completely soaked. I finally got to the surface and was helped out." Thoroughly doused, Detrick went squishing and dripping back to Fire Support Base Emory to clean his M-16 - and himself. 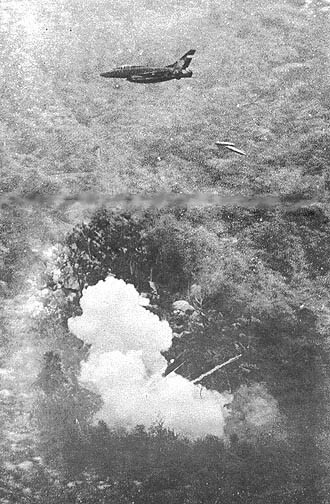 AN AIR FORCE Supersabre jet drops his deadly ordnance at the base of Nui Ba Den Mountain. The fighter pilots had to dive through a 1,500 foot ceiling only to find the side of the legendary mountain staring them directly in the face. TAY NINH - Several attempts were made last month by the 88th Viet Cong Regiment to enter Tay Ninh City. Every one of their attempts failed as the 4th Battalion (Mechanized), 23d Infantry met the enemy forces at the base of Nui Ba Den Mountain. One hundred eighty-four of the combined Viet Cong and North Vietnamese have died in their fruitless attempts to enter the city. During the heavy fighting the Tomahawks used all types of support ranging from an eight-inch Howitzer to the dropping of Chieu Hoi leaflets from a small bird-dog aircraft. 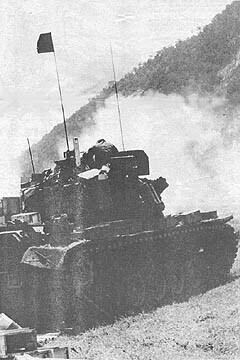 As one of the firefights flared, Company A, of the 2d Battalion, 34th Armor, shot out of their night laager to race toward the ensuing battle at the base of the legendary mountain. Immediately upon their arrival, Chief Tomahawk, Lieutenant Colonel G.E. Taylor radioed for the Dreadnaughts to get on line and begin firing on the enemy positions located in a large rock pile on the side of the "Black Virgin." Care was taken to protect the many shrines and temples which are located on the slopes. As high explosive rounds slammed into the mountain, many secondary explosions erupted. One position after another was silenced as the Dreadnaughts shifted their fire. Enemy radio transmissions being monitored indicated the great accuracy of the guns as the NVA reported more and more casualties. One eight-inch howitzer from B Battery, 2d Battalion, 32d Artillery added its massive might to the combined Tomahawk-Dreadnaught power. 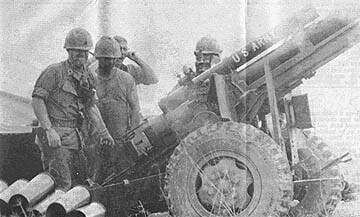 The huge self-propelled howitzer pulled right up to the base of the mountain and fired directly into Charlie's face. The howitzer silenced two 60mm mortar positions and one 82mm mortar position before it turned up its barrel and headed for home. Air strikes proved worth their weight in gold as they pounded the enemy with their lethal loads of heavy bombs. Diving down through monsoon clouds and heading directly for the side of the mountain, the pilots couldn't see the ground until it was staring them directly in their faces. Nonetheless, they dropped the bombs right where they were needed most. The tremendous power of the bombs was just what the doctor ordered to reach the entrenched enemy forces hoping for sanctuary on the side of the mountain. DREADNAUGHTS of the 2d Battalion, 34th Armor head out to support the 4th Battalion (Mechanized), 23d Infantry at the base of Nui Ba Den. More than 265 enemy soldiers died as a result of artillery fire, air strikes and assorted small fire. ON LINE and ready to move out are armored personnel carriers of Alpha Company, 4th Battalion (Mechanized), 23d Infantry. The Tomahawks have been engaged in several actions against Viet Cong and North Vietnamese soldiers at the base of Nui Ba Den. A 90 MILLIMETER high explosive round streaks toward its target on the side of Nui Ba Den Mountain. 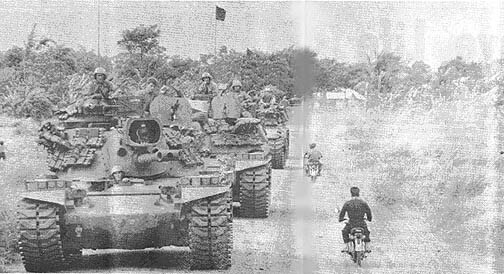 The 2d Battalion, 34th Armor reinforced the 4th Battalion (Mechanized), 23d Infantry, as they engaged the 88th Viet Cong Regiment. LTC G.E. Taylor, Chief Tomahawk, pulls the cord to fire a 105mm Howitzer round at the entrenched enemy on the slopes of Nui Ba Den. The artillery piece belongs to the 7th Battalion, 11th Field Artillery. CU CHI - After nearly six months of intensive care, a 17-year-old Vietnamese boy has returned to a normal life. He could never have done it without the help of the 2d Battalion, 14th Infantry. With Golden Dragon support, the youth was sent to the United States for heart surgery and rehabilitation. THE INFANTRY troopers learned of the case in December when a company from the Golden Dragons brought in several Viet Cong suspects to Fire Support Base Keene. In the group was a young man named Thi Van Liep. During questioning, the interrogators noticed Thi was short of breath and easily became exhausted. His condition was brought to the attention of the Dragons' battalion surgeon, Captain Richard Tessler. After examining Thi, Tessler diagnosed his conditon as severe heart weakness. He knew the boy needed immediate medical treatment, but the necessary care was not available in Vietnam due to lack of equipment. The lad had to go to America if there would ever be any hope of a cure. Knowing the time element was a major factor, Tessler started checking channels to arrange passage for the boy. TESSLER BEGAN by contacting Major Prentice Smith at the Third Field Hospital in Tan Son Nhut. Smith then examined the young Vetnamese and gave the official referral of Thi's condition. 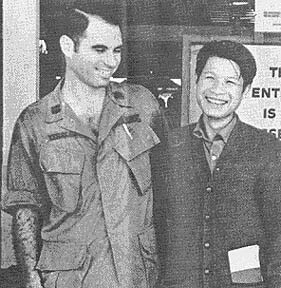 After many letters of inquiry to South Vietnamese and U.S. officials in Saigon, Tessler was granted approval. The problem of finding travel and living accommodations for Thi - not to mention setting up a time and place for the operation - still remained to be solved. Tessler turned to his parents in Hollywood, Fla. for help. Through them, he started his correspondence with the necessary people in the States. He wrote to Congressmen, the Miami Herald and the Miami Heart Institute, along with many other services and organizations. SOON TESSLER received letters from Pan American Airlines saying it would take care of all transportation from Saigon to San Francisco and back. The Miami Heart Institute volunteered to perform the operation free of cost, and Tessler's parents were named the guardians of the boy during his stay in America. On February 5, Thi left for the United States, where he was introduced to James Shea of Coral Gables, Fla., who spoke fluent Vietnamese. The operation was performed at the Miami Heart Institute with Chief Surgeon Dr. Thomas Gentach supervising. The damaged part of the heart was the aortic valve, which allows the blood to pass out of the heart into the rest of the body. Because the valve was damaged, blood would flow back into the heart after it had been pumped out. The operation was termed a success and during Thi's recuperation period, he stayed in a nursing home under doctor's care. He recovered successfully without any complications. WHILE RESTING after the operation, Thi spent much of his time at the home of Tessler's parents. He also wrote two letters home and received one from his mother. He was so concerned about the war in his homeland that he was given a Vietnamese newspaper to read for himself. Thi also swam three times a week in a nearby pool, watched a touring zoo and went on boat rides. His opinion of color television was, "It was like magic!" THI SAID THE weather in America was too cold for him. He liked all the food, but most of all he liked root beer. Still, Thi admitted, the food back home was better. On Sunday, June 1, a contingent from the 2/14 went to Tan Son Nhut to meet Thi on his return. Also there to meet him was Tessler, now with the 36th Evacuation Hospital in Vung Tau. When asked what he thought about the operation, Tessler said, "He's very, very lucky to be back." CU CHI - Regional Forces from Bao Tri Province have recently completed supply and maintenance instruction to aid them in their supportive efforts of the war. The training was conducted in Cu Chi base camp by the 25th Supply and Transport Battalion. The 20 RF soldiers were taught how to maintain and operate the various types of cargo vehicles which they will use in support of their combat troops. Leading the instructional periods were First Lieutenant William O'Conner, Staff Sergeant Ronald L. Smith, and Specialist Five Ben D. Vaughn, all from the 3d Platoon, 25th Supply and Transport Battalion. Complete instruction was also given in all phases of preventive maintenance for the vehicles. The instructors emphasized the importance of caring for the equipment in order to keep it operating and prolong its life. The point seemed to get across as the RFs took an active and eager interest in this particular phase. At the completion of the schooling the Regional Force soldiers were presented training certificates for their achievement. Within the area of operations of the 25th Infantry Division, more and more Vietnamese people are being trained and instructed in all phases of operating and supporting combat efforts. It is through this training that the Army of the Republic of South Vietnam has grown to its present strength. REGIONAL FORCES show a live and active interest in learning all phases of supply and maintenance dealing with supporting combat troops. Above, the RFs are shown a phase of maintenance performed on the two and one-half ton truck which is used to supply field locations. LIKE A GIANT CLAW the bridge track of the 4th Battalion (Mechanized), 23d Infantry reaches out for the other side of the river. BRINGING THE BRIDGE - Approaching the small Rach Bio Nau River near Fire Support Base Rawlins, the new bridge track moves into position to launch its portable load. TAY NINH - With the rainy season fast approaching, mechanized infantrymen of the 4th Battalion (Mechanized), 23d Infantry received a new Army innovation to help their armored personnel carriers cross swollen streams. The new device is nothing more than an armored personnel carrier with a portable bridge mounted on it. 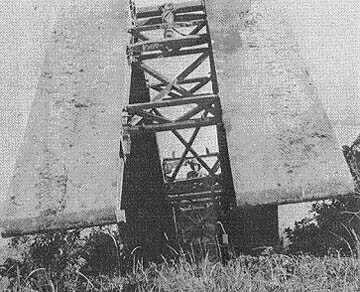 A hydraulic system was added to manipulate the folding bridge. The simplicity of the portable bridge adds to its effectiveness. The Tomahawks operate in rough terrain, where a complicated machine might break down. 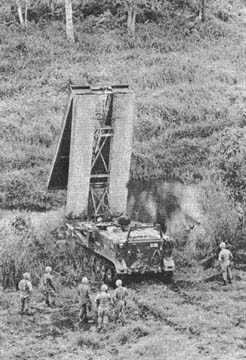 The official nomenclature of the bridge is Armored Vehicle Launcher Bridge, but the Tomahawks have nicknamed it the "bridge track." Sergeant Emmett Simpkins of Radcliff, Ky., bridge track platoon sergeant, was impressed with the new machine. "At first I had my doubts, but after we tested it I changed my mind. On our first mission, a sweep near Tay Ninh City, we had to cross the small Rach Bio Nau River. The bridge track worked like a charm," said Simpkins. The chief Tomahawk, Lieutenant Colonel G.E. Taylor of Shelby, N. C., was also impressed with the new track. "We can save countless miles now by using these portable bridges," he said. "Before, we had to search for a safe place to cross a stream, which sometimes took hours. Now it's just move the bridge into position and cross over it. The bridge track has found a home in the Tomahawk hunting ground," said Taylor. BRIDGE SPAN reaches 33 feet which enables easy crossing of any river or crevice less than 33 feet wide. 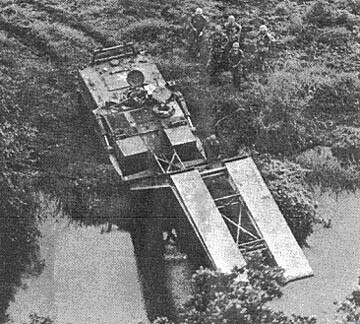 Here the Tomahawks lower the bridge across the Rach Bio Nau river near Tay Ninh city. 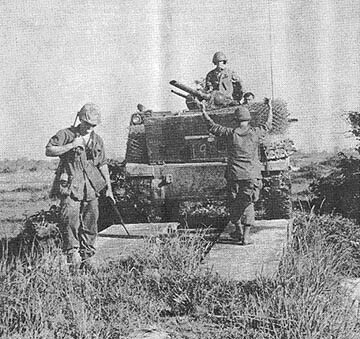 Directing an armored personnel carrier across the newly laid portable bridge is a Tomahawk from Headquarters Company, 4th Battalion (Mechanized), 23d Infantry. Infantrymen from Alpha Company watch the hydraulically controlled bridge lift off the armored personnel carrier to stretch across the river. CU CHI - Thanks to the 2d Battalion, 12th Infantry, the Viet Cong's food supply has been gradually diminishing. The Fire Brigade troopers have hauled in a total of 11,300 pounds of rice during the last month. Company B was awarded the coveted fried rice award for uncovering the last two major finds. While on a sweep operation near Patrol Base Dees, Bravo Company uncovered approximately 7,500 pounds of unpolished and 350 pounds of polished rice. The rice was found in three different caches located only a few meters apart. The rice was reportedly uncovered in freshly abandoned hooches in the Citadel area north of Cu Chi. The rice was found in both bins and bags. According to Specialist Four Ralph W. Buchanan of Morganton, N.C., Bravo Company had just passed by a heavily boobytrapped area when the hooches were spotted. People had recently been living in the huts, but had apparently left when they spotted the Warriors. One ton of rice was found in the first structure searched. The toll mounted as. the infantrymen swept through the other huts. Three days later the Warriors made an airmobile assault into the Ho Bo woods. Again Bravo Company walked away with the enemy's rations as they found a 4,500 pound cache. The load was so heavy that Charlie Company had to return the following day to evacuate the remainder of the rice. As the last grains were being removed, 12 enemy soldiers were spotted. Gunships and artillery worked over the area of contact before the Warriors maneuvered toward the positions. The enemy soldiers had fled, leaving behind another store of the white grain. The rice was stored in shallow holes covered with North Vietnamese ponchos. Plastic bags protected the rice from moisture. Private First Class Grover Durden of New Rochelle, N.Y., who aided in loading the 6,500 pounds of rice in the last cache, found that the rice was stored in bags manufactured in Cargille, N.Y., which is only a few miles from his hometown. CU CHI - Somewhere in the Citadel area six miles northwest of Cu Chi there is a Viet Cong property books officer who is having trouble accounting for his supplies. Little does he realize that he cannot trust all of his supply sergeants. A local intelligence source led Alpha Company, 2d Battalion, 12th Infantry to an area which had seen recent activity by enemy soldiers. The Warriors started probing around the area and located several 55 gallon drums covered with mud and foliage. Inside the drums were enemy weapons and projectiles. Alpha Company's commander, Captain Ronald J. Walters of Kansas City, Mo., exclaimed, "This is the only way to fight a war. It's great to go out knowing what you're looking for, but then finding it is like icing the cake." The cache included two complete 61mm mortar tubes, a field radio complete with repair kit, 36 57mm recoilless rifle rounds, several AK-47 rifle magazines, three bangalore torpedoes and a host of mortar rounds and claymore mines. As the Warriors moved out of the area laden down with the captured goods, they met head-on with an estimated Viet Cong squad. Seven of the would-be ambushers died in the hail of lead thrown out by the Warriors. With the firefight ended, the company headed back to FSB Pershing to clean the captured enemy equipment. The mortars will still be used, but this time against the enemy. TAY NINH - A combined civic action program by the U.S. Army and Navy, Vietnamese Regional Forces and Tay Ninh Providence Hospital officials took place recently in the small village of Tien Thom in the 1st Brigade's area of operation. Less than a kilometer away from the Cambodian border in an area known as the "Angel's Wing," Tien Thom had previously been unable to receive any medical aid because of concentrated enemy activities in the vicinity. "I'VE SEEN the plague here, and these people really need help," said Captain Thomas Thurman of North English, Iowa, medical officer for the 4th Battalion, 9th Infantry Manchus. "Every year when the rainy season starts, rats are driven from their holes to higher ground, and they present a real danger - especially to small children." Nurses were brought up the Oriental River from Go Dau Ha to a spot near Tien Thom on an armored troop carrier boat of the Navy's River Assistance unit number 13. A truck took the party the rest of the way while a Manchu unit stood by to make sure that no harm came to the civilian nurses. 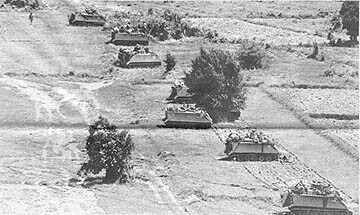 The 3d Battalion, Vietnamese Regional Forces provided additional protection. During the day, the nurses gave about 300 shots. Meanwhile, Captain George H. Dias Jr., of Fayetteville, N.C., the Manchus' S-5 officer, supervised the distribution of candy, caps and pictures to all the children who braved the needle. FIRST LIEUTENANT Lesley A. Witmer of Leolla, Pa., 1st Brigade assistant S-5 officer, commented, "The participation we've had today is just amazing. The security in this area is low and there have been lots of problems, but after today I'm sure the people will be willing to help us all that they can." Late in the afternoon the party returned to the river where the Sea Bees were waiting to take them back to Go Dau Ha. Co-operation between various allied elements from Tay Ninh province has made it possible for most people in Tien Thom to live through the rainy season without fear of the plague. DELICATE WORK - Nurses from Tay Ninh Hospital carefully measure out the correct dosage for plague shots to be given to the citizens of Tien Thom. CU CHI - Nearly everyone is familiar with the name "Westmoreland." General William Westmoreland is now Army Chief of Staff and before that was commanding general of Military Assistance Command Vietnam. The 2d Battalion, 12th Infantry has its own Westmoreland. He is Specialist 4 James Gary Westmoreland of Royal Oak, Mich.
"Someone asks me every day if I'm related to the general," Westmoreland said. "It doesn't bother me for people to ask. He is my second cousin to be precise. I regret to say I've never met him, but I hope to when I return to the States." James' friends like to kid him about "pulling rank." The men of the weapons platoon he serves in often call him "Westy" or "General." Westmoreland was selected Soldier of the Month for the Battalion and attended Tropic Lightning's combat leaders' course. One platoon member said he was glad to have "Westy" with him, since he'd be able to tell his grandchildren he served with Westmoreland. LOOK OUT BEHIND YOU! 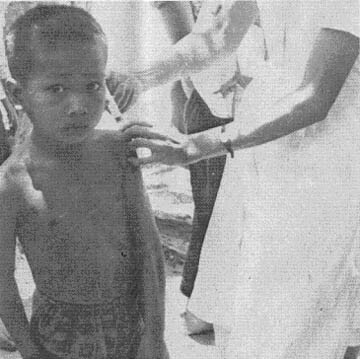 - This young resident of Tien Thom village looks apprehensively at photographer Bob Stephens while a plague shot is administered from the rear.